Preserving objects illustrative of and significant to natural and cultural history. Contributing to knowledge by promoting and facilitating research in appropriate fields. Disseminating this knowledge to the Oregon public, through both formal instruction on campus and public education outside the boundaries of the University. 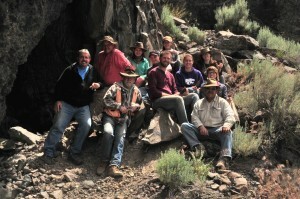 2011 UO Paisley Caves archaeological field school. MNCH provides research opportunities for Anthropology students and faculty through field projects and collections analyses, and museum experience through the public programs division. A number of undergraduate and graduate student programs exist, including Oregon Archaeology, Participatory Learning Experiences (PLE), summer field schools, graduate teaching fellowships, and internships. MNCH also has diverse offerings, including lectures, tours, and other events that are of interest to Anthropology faculty and students. The Museum of Natural and Cultural History will be working to integrate their biological collections, including that developed by Patrick O’ Grady (MNCH- Research Division) and the Condon Collection managed by Edward Davis (MNC-Collections Divisions), with other biological collections on campus such as the UC Comparative Primate Collection (curator: Frances White) and the Zooarchaeology Laboratory (curator: Madonna Moss). Integration of all the University of Oregon biological collections, in the name of data accessibility, is shared aspiration among this community for the near future. This achievement requires communal efforts in various departments, and much of this integrative work, in addition to continuing curatorial maintenance, is made possible by students and faculty all over campus. MNCH enjoys a close relationship with the Anthropology Department, as many on-campus anthropologists are involved in projects at the museum, in anthropological collections, and in the classroom. For more information on MNCH programs and current events, please visit the website at http://natural-history.uoregon.edu.